“We struggle to make sense of life segment by segment instead of as an over-all flow. Viewing everything fragmentarily, like pieces of a jigsaw puzzle, no coherent picture emerges, no path, and no direction to guide our understanding. There is a way for us to find that path, however – to feel a part of that greater reality, and therefore to know what is right for us as individuals. That way involves opening ourselves and becoming receptive to higher potentials of consciousness within ourselves, and thereby of living in harmony with the world around us. It involves developing our own inner sense of intuitive guidance. Try this now: Relax your body. Uplift your eyes gently to the point between the eyebrows, the spiritual eye. 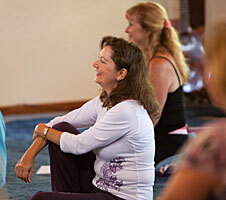 Sit quietly and concentrate on the flow of your breath as it enters and exits the nose. Allow the mind to quiet at it concentrates more and more deeply on the breath itself. When the mind becomes still, offer up a question you may have to that point between the eyebrows. In the silence, listen for a whispered answer. With this program, you will receive a copy of the book Intuition for Starters by Swami Kriyananda.